Towards Tomorrow Energy were involved from the planning stage when a young couple were building their dream farm homestead in the small heritage township of Bellbrook, in the Mid North Coast hinterland of NSW. The couple required their home to be designed to suit the inclusion of an off-grid solar power system that would continue to meet their needs in the decades to come. The cost of the connection to the electricity grid was prohibitively expensive at more than $120,000. It was also important that they avoided extensive tree clearing and trenching in native bushland that connection to the grid would have entailed. As is typical in a new build, the designs, load requirements and budgets changed. So Towards Tomorrow Energy designed a system that was fluid in terms of capacity without compromising the essential reliability and functionality of the installation. Towards Tomorrow Energy carried out a complete site and energy audit of the customer’s electrical loads, including assistance with the specification of all white goods, pumps, septic system, LED lighting and all cooking, heating/cooling options. A complete renewable energy solution was proposed that included the use of LED lighting, induction cooktop, solar hot water heating and improvement to the building’s insulation. SP PRO to utilise the generator a little more under heavy load to conserve battery storage, and also the addition of a relay to separate the load of a small air-conditioning unit. 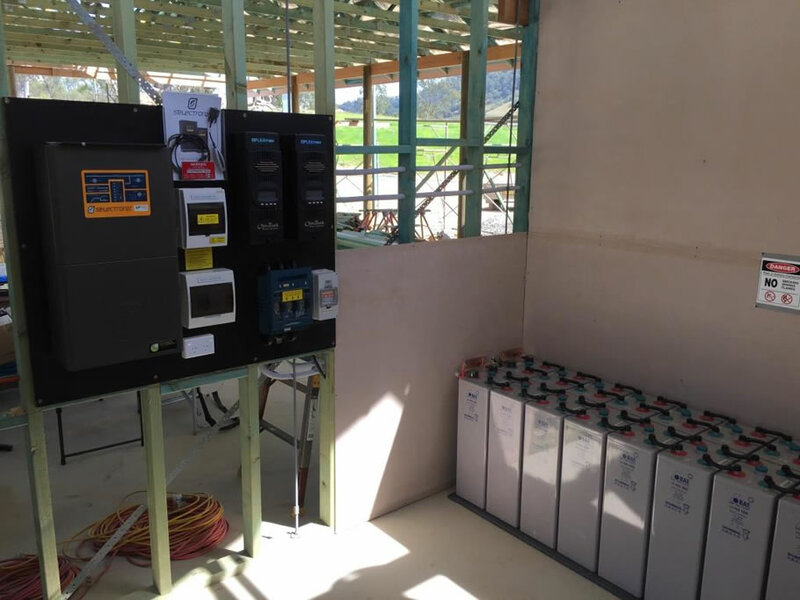 The client was extremely happy with their off-grid solar power system and the resulting savings of more than $120,000 in upfront costs by not connecting to the electricity grid. They were also pleased to avoid the tree clearing and trenching that would have been required to connect electricity poles and wires to the farmstead.